Proven winner and championship-caliber coach Per Nilsson will lead the Pepperdine women’s tennis team into a new era as he has been named to succeed Gualberto Escudero as the head coach. 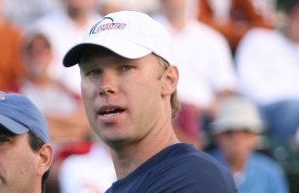 Nilsson is a familiar face in Malibu and was an assistant coach for the Waves' men's tennis team for five seasons, including the 2006 squad that won the NCAA championship. "I am so excited for Per's return to Pepperdine to lead our women's tennis program," said director of Athletics Steve Potts. "Per has enjoyed great success all along his coaching career and I am confident that he will be able to take our very successful program to even greater heights. Per's commitment to our Christian mission, to the academic well-being of our student-athletes, and to competing for championships at the highest level make him a great fit for Pepperdine." After leaving Pepperdine in 2007, Nilsson spent the last seven seasons coaching the men's squad at his alma mater, Mississippi State. There he compiled a record of 95-76 while going 36-42 in the tough Southeastern Conference. He led the Bulldogs to back-to-back SEC West titles in 2011 and 2012 and brought MSU to four-straight NCAA Tournaments from 2011-14. "I'm still speechless," Nilsson said upon his hiring. "I will never forget my first day at Pepperdine 12 years ago. It is such a special place and a dream to return and coach the women's team." "I want to sincerely thank Dr. Potts and President Benton for giving me the opportunity and entrusting the women's team to me," he continued. "Coach Escudero has built an amazing program at Pepperdine and it's such an honor to be able to work alongside him as we continue to move forward." Nilsson takes over for Escudero, who has been at the helm for 37 seasons beginning in 1977-78. He stepped down at the end of the 2013-14 campaign, but will remain on staff as the associate head coach. Nilsson inherits a team that has made 27 consecutive NCAA Tournaments and captured the West Coast Conference championship for the 24th time in 2014 while earning a final national ITA ranking of number 24. "I was very happy to hear Per will be joining the team," said Escudero. "He has the energy and knowledge to recruit and train really well and take us to the next level, especially in our doubles game. I can't wait to work with him." "Gual and I have been friends for a long time," commented Nilsson. "He knows the team and knows how to motivate the players. The girls know the coaching change won't be very drastic, which will be helpful with the transition. He knows a lot about tennis and I can add a lot to that and together we can take the team to the next level. It is an exciting and new challenge for me and I can't wait to get started." In his six seasons in Starkville, Miss., Nilsson's squads produced four ITA All-Americans and 17 All-SEC selections. His eye for recruiting and developing young talent is evident as a Mississippi State player garnered SEC Freshman of the Year honors in three of the last four seasons. In 2013, Romain Bogaerts not only took the conference's top rookie award, he was also honored as the ITA National Freshman of the Year. Nilsson first brought the Bulldogs to the NCAA Championship in 2011, their first appearance since 2005, and MSU advanced to the second round. After reaching the second round again in 2012, Nilsson's young 2013 team eclipsed expectations and advanced to the NCAA Championship round of 16 for the first time since 2001. Mississippi State made their fourth-consecutive appearance at the tournament in 2014 and reached the second round. Nilsson has racked up the honors for himself as well throughout his time at MSU, including an SEC Coach of the Year honor in 2011 and two ITA Southern Region Coach of the Year honors in 2011 and 2013. In the classroom, Nilsson's teams have been just as dominant. MSU has been named an ITA All-Academic team for the past five seasons, producing 40 Academic All-SEC selections and 29 ITA Scholar-Athlete selections. Nilsson has also had two players named Capital One/CoSIDA Academic All-Americans. Nilsson was an assistant coach for the Pepperdine men's tennis team from 2003-07 under head coach Adam Steinberg, where the Waves went 119-38 in those five seasons. Easily highlighting his resume while in Malibu was the 2006 campaign when Pepperdine claimed its first-ever national championship. Nilsson was very involved in Pepperdine's recruiting efforts leading up to that season, which saw the Waves post a 36-2 record and hand Georgia its only loss of the season in the NCAA title match at Palo Alto, Calif. Leading up to that crowning season, Pepperdine improved from number 27 in the country in 2004 to number eight nationally in 2005, a year in which Nilsson was named the ITA's West Region Assistant Coach of the Year. The Waves advanced to the NCAA quarterfinals that campaign, ending at 24-3. Nilsson played collegiately at Mississippi State from 1992-94 and helped the Bulldogs earn three consecutive top-10 finishes in the rankings. MSU reached the round of 16 at the NCAA Championship in 1992 and 1993 before reaching the semifinals in 1994. Serving as team captain during his senior year, Nilsson is ranked number six on the Bulldogs' all-time career victory list in both singles and doubles. Nilsson was a student assistant coach at Mississippi State during the 1994-95 season before working as a tennis professional at the Capital City Country Club and St. Marlo Country Club. From 1998-2000, he was the Director of Tennis at Appalachee Farms. A native of Lund, Sweden, Nilsson was a high school exchange student at Jackson (Miss.) Academy and was the 1990 Mississippi Academy singles champion. He is married to the former Beth Vennerstrom.